I was out walking with friends the other evening, and on Gertrude Street in Fitzroy I came across two beautiful interventions in public space – really two of the most delightful and pleasurable pieces of work I have seen in a long time. I’ve found it hard to put a name to what kind of work they are: I suppose the name that would most obviously be given to them would be ‘yarn-bombing’, but seeing these works made me realise how little I like that term and how inadequate I think it is for the grace and delicacy involved in these works, in which knitted woollen shapes are fastened around a grey metal pole, and white lace is fitted closely to the narrow trunks of nearby trees. As you can see, part of the visual pleasure in the works is how they make the man-made pole and the natural tree trunks somehow akin to each other, linked by their verticality and their new roles as part of the street sculpture. 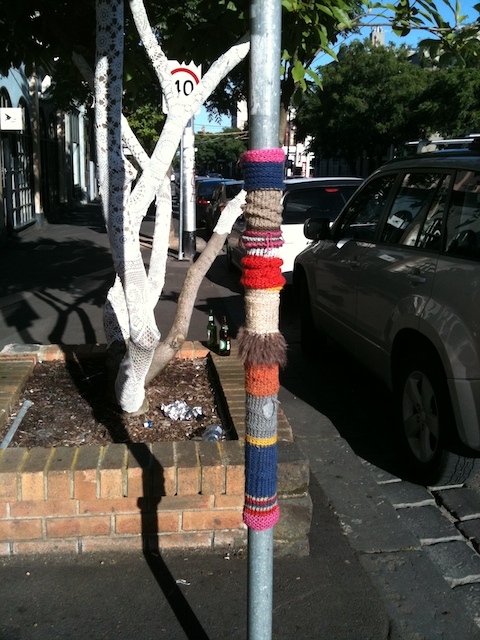 ‘Yarn-bombing’ draws an analogy with tagging, whereby a writer puts up their tag so often that a city or a suburb is ‘bombed’ by the tag. Somehow that just doesn’t seem right with these sorts of works, and I think a new name needs to be found: textile sculptures? fabric sculptures? The works use a textile, such as wool or cotton, to make shapes in public space, but they also work with the shapes already present: in these images they are wrapped around the trees and around the pole supporting a street sign. 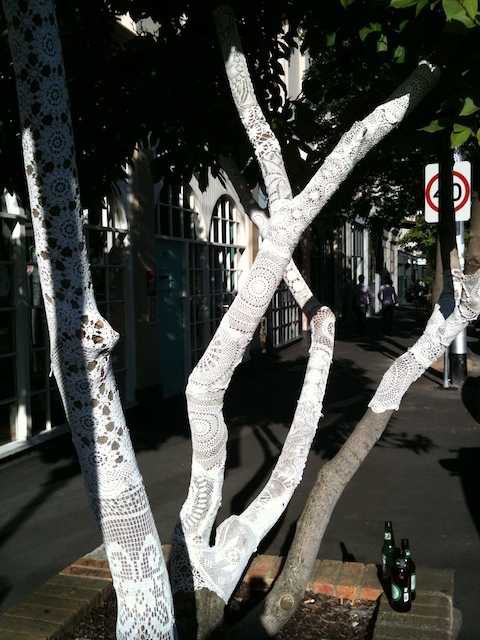 To that extent the work is dependent on transforming something into part of the sculpture, so that a pole is no longer just a pole, and a group of trees becomes part of a delicate network of lace. Encountering these works really was a delight: we all exclaimed out loud and stood and admired them for several minutes. It is an incomparable example of the potential for street art to intercede in public space in a manner that brings sheer joy to the spectator. Maybe others might walk past feeling simply puzzled as to their presence or thinking dismissive thoughts about the purpose of the activity. For me, it demonstrates the care and effort that can be involved in street art. How long did it take to make these works? How did the artist(s) select the site? And it demonstrates that street art still has the capacity to create moments of delight in the midst of the city.